Now if anyone who reads this knows me personally they will know that I don't just like to go shopping on spending sprees, I go on spending rampages! I never do anything in moderation and have no concept of money! I see the £££ and I just spend it, until I realise after that it wasn't such a good idea, but do I ever learn? Nope! My monthly outgoings are very low and I just spend the rest of it and never save! This isn't good! I did a breakdown of all of my outgoings the other day and felt kind of sick at how much money I had left each month, that I just flitter away! Now don't get me wrong, I get great pleasure from shopping but at the age of 32 I really should know how to manage my money! I have the start of some dental treatment this month and I needed to put down a £960 deposit so that my monthly repayments would be quite low and over a shorter space of time. Well my original appointment was back in March and guess what? I didn't put a penny away for it! Now my first appointment is on the 15th of this month and I'm like shiiiiiiiiiiiit as this will be when I will choose my payment plan! So of course my teeth are far more important than shopping in Boots and filling up my basket full of 3 for 2 offers! So as a result of not preparing for this deposit I've needed to take it all out of this months wage, which is a bloody lot of money! I've put in one account my monthly outgoings and I've put aside my monthly travel and with the remaining money I've split it up to give myself a weekly allowance and there is also a little left over which is for a few nights out that I have planned for this month. 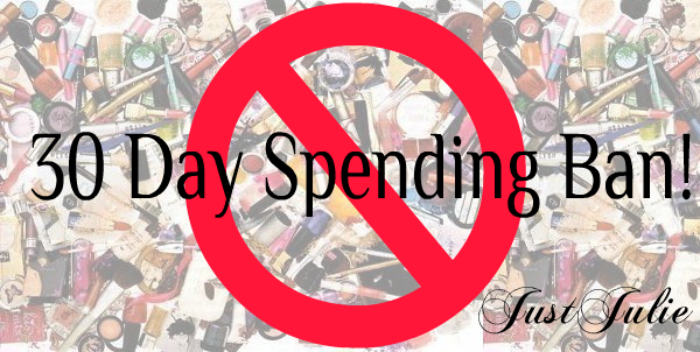 I intend on not spending the full weekly allowance either, as if I'm not going to be popping into any other shops then this shouldn't be an issue! I also have IMATS at the end of June so to be honest I want to hold off buying any makeup until then, cos I'm going on a big spree then! ha! This is going to be soooo hard but it's not a point of just wanting to try not to spend it's a necessity to put myself on a ban! Now if I manage to actually do this I will deserve a bloody medal and IF I manage to not spend my weekly allowance and actually have some money left over at the end of the month, I may just have a heart attack!!!!! My spending ban starts from the 28th of this month (my pay date) and the last day will be the 27th of May. I will post an update sometime throughout the month on how I've got on, if I've not spent my whole weekly allowance ect and I will be totally honest!